The Venetian is the ultimate classic hotel. You'll enjoy every moment of your stay here! 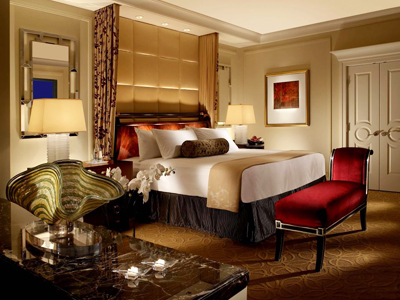 Reserve your room at Venetian Las Vegas to save up to 25%. 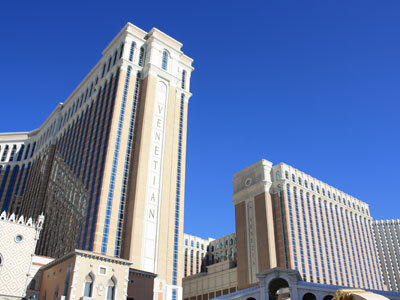 Venetian is a luxury five-diamond all suites hotel located on the Las Vegas Strip. Approximately four miles from the airport, this property boasts an elaborate Venice, Italy theme complete with gondolas and canals. The Venetian prides itself on bringing the lavishness of Venice’s fine dining, shopping, and sights to Las Vegas. One of the premier luxury hotels and casinos in Las Vegas, the newly renovated Venetian all-suites hotel, will have you feeling like a V.I.P. the moment you arrive. The old world charm is displayed throughout the hotel’s many Venetian features such as the cafés surrounding St. Marks Square, the Grand Canal with authentic gondolas floating by, or the many stunning frescoes throughout the hotels plush surroundings. 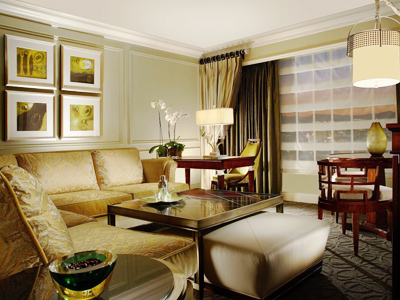 The over 4,000 suites offer opulent features in these very large beautifully decorated rooms. Features include private bedrooms, marble bathrooms with deluxe toiletries, multiple flat screen TV’s, and large living rooms. The Tower rooms offer an even more luxurious feel with high ceilings and enormous rooms and a private check-in. The excitement awaits you on the beautifully appointed casino floor featuring slots, table games, race and sports book, and a poker room. The marble floors and plush surroundings add to this posh experience. Of course the fine dining includes acclaimed restaurants conceived by 6 James Beard award-winning chefs. As you can imagine, the Italian restaurants are some of the best in the world. 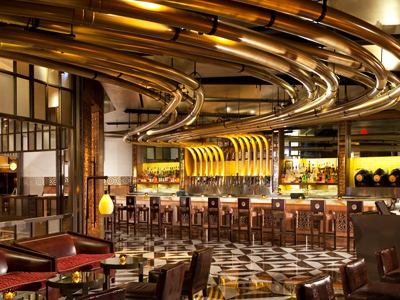 There are 40 restaurants on the property; with at least 10 fine dining restaurants and more than 9 casual restaurants, the Venetian has something for everyone. The entertainment is extraordinary with many famous headliners, and shows like Human Nature Jukebox. If that’s not enough, visit the Madame Tussaud’s Wax Museum or take in some nightlife at one of the many nightclubs or lounges. For recreation, enjoy yourself at the amazing pools where poolside dining and cocktails await. The renowned Canyon Ranch Spaclub offers a state of the art fitness facility and lavish spa treatments. Travel along the Canal shops and you will feel like you are shopping along the streets of Italy. 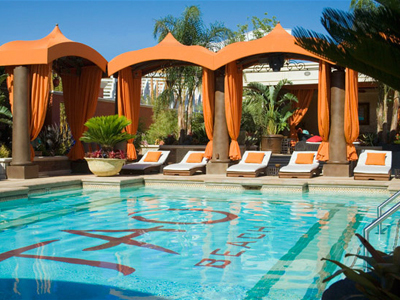 Spa/Salon: The Canyon Ranch Spaclub is the premier spa and fitness center in the Venetian. The fitness center is state of the art with cardio equipment, classes, and a 40 ft. climbing wall. The spa offers a wide variety of massages, spa treatments, and a full service salon. Pool: The roof top pool deck features three lovely pools scattered throughout the charming Venetian gardens, a hot tub, 23 cabanas, Poolside dining, and full cocktail service. Gondola – Provides gifts, souvenirs, and fashion apparel. The Grand Canal Shops: Over 70 shops and cafés offering a wide variety of stores featuring men’s, women’s and children’s fashions, bath and body, jewelry, housewares, cards, gifts, toys and specialty items. You may feel like you took a trip to Italy instead of Las Vegas while cruising down the canal in an authentic gondola. This has a charm and romance about it that must be experienced to be believed. Befriend the stars at Madame Tussauds Wax Museum. Enjoy this interactive visit with celebrities and make sure to bring your camera. The photos will be of you with the rich and famous. Need to chill while in Vegas? Check out the newest Minus 5 Ice Bar at the Venetian/Palazzo for a V "Ice" P time. The VOID has created a fully immersive adventure with interactive sets and real-time effects. Enter the virtual world of Star Wars and visit a galaxy far, far away. Top-selling pop vocal group Human Nature brings a retro and contemporary sound to you at the Sands showroom. This “Jukebox” tour is a playlist of hits from Doo-Wop, Motown, Soul, old standards and recent pop smashes. The Asian décor at TAO beach is natural and inviting. The dance music and European style sunbathing make this tropical paradise the perfect party spot. Try one of the TAO-tinis for a truly unique cocktail experience. Old school cool meets new world cocktails at The Dorsey. Enter the refined world of the cocktail lounge and enjoy your libation nestled into the leather couches in front of the fireplace. Primeburger offers burgers, steaks, fries, milkshakes and even breakfast with tastes inspired from around the world. We enjoyed ourselves at the Venetian. The location is right on the strip so that was very convenient. The resort is elegant and family friendly. Our kids enjoyed it too which was a plus. We loved the room. It had everything we needed. Hated to leave, can’t wait till we go again! The Venetian exceeded my expectations when I stayed with my family last week. The room we had was beautiful and much like a suite, I felt like a queen! The pools were great, and we got into one of the more private pools so we felt like VIPs! I loved the convenience of the food court and all the shopping at the Canal shops without ever having to step in the heat. We were there July 3-8, 2014 and it was extremely hot. The air condition didn’t work in the room. The 2nd day someone finally fixed it. Then my boyfriend accidentally knocked off a box of nuts from the mini bar and he put them right back within seconds. When I got home they charged my credit card for the whole mini bar. It took a week to get it straighten out and for them to credit my card. But the worst thing of all was when I was in the bathroom with the door open I received a knock on the door. I thought it was someone who got the wrong room but it was Venetian maintenance man looking for a guest with a leaking faucet. He unlocked my door and walked right in. Luckily I pulled my pants up before he could see anything. The Suite was extremely spacious and clean! I loved the Italian feel to the room. It had such a beautiful decor! I enjoyed that the living area was separate from the bedroom, by a railing a just a few steps, but it gave the room a much more homely feel to it! The room was definitely beautiful and luxurious! Booked last minute on Priceline. When we arrived we were happy to find out it was a suite…and boy was it sweet;) nice bed, 3 tvs total, including one in the bathroom, and even a little living room. Staff was very friendly! Would definitely stay here again! Only downfall was that there were no table limits for under $50. But I guess that’s what happens at a 5 star. We really enjoyed the hidden garden and pools on I believe it was the 4th floor. A great location! Great 3 day romantic getaway! We spent 3 nights, and enjoyed it immensely. We did the slip a 20 under the credit card and were upgraded. Our suite was beautiful, it even had 3 tvs! The hotel rooms are pretty large and very nice -loved the elegant decor. The location is perfect, right in the middle of the strip. We loved the feel of this hotel. Totally romance, from the gondola rides to the cloud painted ceiling. This hotel is really large, so we did get lost a few times!! Also we ate at the Bouchon Restaurant, it is a must do! We didn’t get a chance to swim, but the pools looked great! We did do the show Blue Man Group–worth the money! Fun date night! The Venetian was everything everyone told us it would be! Classy hotel, huge rooms. Lots of things to do in the hotel. Convenient location on the strip! Our room faced the strip and the room was better than we expected. Great nights sleep on the mattress! Our hotel deal came with a continental breakfast. It wasnt the greatest, but we didn’t have to leave our room! The pool had a crowd, but we were able to get 2 loungers. Can’t wait to go back! The check in line was long, but the line moved quickly. The staff was great and our room was ready upon arrival. The walk to our room took a little time, but having been to Vegas we were used to that routine. The smell is the casino was a citrus smell, a lot more pleasant than smoke. We were impressed by how big the room was. My wife loved the decor.The pool area was amazing, guests have the choice of the Venetian and the Palazzo pools. We had a wonderful meal at Tao. Worth the price! Our biggest complaint was the added resort fees!